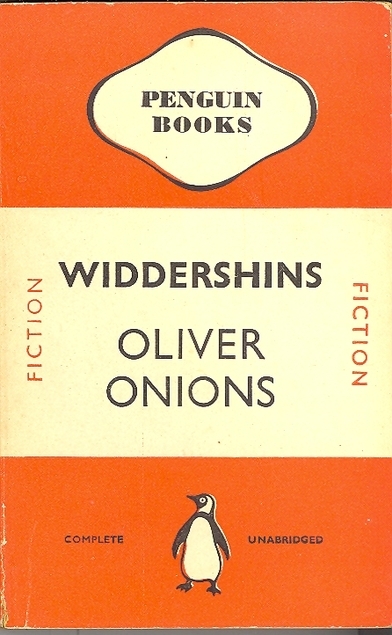 Widdershins by Oliver Onions is a book of eight short stories which was published in 1911 and it’s a collection of ghost stories. Oliver Onions was born in Bradford, Yorkshire in 1873, and he had a very long writing career. I don’t read short story collections all that often but I’ve inadvertently read two in a row now, I was under the impression this was a novel to begin with. Ghost stories aren’t really my thing but Onions was definitely a good writer. The first short story The Beckoning Fair One is 81 pages long so is really a novella, and that is the one that I liked least. A man moves into an old house which has been lying empty for years and he seems to be taken over by a jealous malevolent spirit. It was a bit odd to be honest, but that’s probably the way of all ghost stories. This is apparently one of his best known and compares well with The Turn of the Screw. I felt that the other seven stories were more successful though so this ended up being a good read. I would like to know how the title of the book was decided but we’ll never know I suppose. Widdershins or Withershins as it is sometimes spelled is the Scottish word for anti-clockwise, although I believe that the word is also used in astronomy. I mentioned earlier that I only bought two books in Wigtown (Scotland’s book town – allegedly). I managed to get a lovely hardback copy of Dorothy Dunnett’s Scales of Gold, it’s one of her House of Niccolo books. I also bought a Virago, The Flint Anchor by Sylvia Townsend Warner in a shop called Byre Books which is hidden away behind some houses on the main street. Jack had looked up an online list of secondhand bookshops in the UK. There was a shop listed in Gatehouse of Fleet, a very small town with not a lot in it, but a very wee shop on the High Street has a mixture of art and old books for sale. I managed (just) to stop myself from buying any of the art but I couldn’t resist buying three books. Beth Chatto’s Garden Notebook. I don’t have any of her books but I used to read her articles and when we lived in Essex for a couple of years we were close to her garden, but I used to always just catch a glimpse of it from the bus to Colchester. She died just last week but she was a good old age, over 90. Peeps at Many Lands is a series of travel books and I bought the Corsica book which was published in 1909. It was written by Ernest Young and illustrated by E.A. Norbury. Published by Adam and Charles Black. It has some nice colour illustrations. 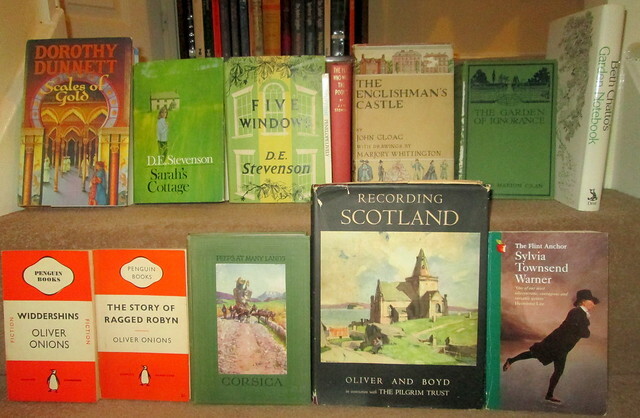 I think the man in the bookshop thought that I just bought books with pretty pictures because the other book I bought there is The Englishman’s Castle by John Gloag with charming illustrations of various sorts of grand homes by Marjory Whittington. This was was published in 1944 and has that Book Production War Economy Standard logo on it. I have quite a lot of books published in wartime and I must say that although the paper was supposedly not the best quality they’ve all fared well over the years, much better than modern paperbacks anyway. They seem to begin to deteriorate after just ten years or so. Incredibly there’s another bookshop in Gatehouse of Fleet although it’s a bit more difficult to find as it’s housed in part of an old mill by the edge of the River Fleet. It’s a lot bigger and has mainly old books, I don’t think there is much at all in the way of modern-ish paperbacks which suits me fine. I bought a book by J.I.M. Stewart called The Man Who Won the Pools. Also The Garden of Ignorance by Mrs. Marion Cran which was published in 1917 I believe. The last one I bought there is called Recording Scotland, published by Oliver and Boyd in 1952 and has loads of lovely illustrations of places in Scotland by famous artists. Somewhere I bought a copy of Penelope Lively’s A Stitch in Time, one of her books she wrote for children. On the way back home we drove along the Ayrshire coast and into Lanarkshire with the intention of visiting Garrion Bridge, an antiques centre that we hadn’t been to for years. To be honest there’s very little there that could be described as an antique but we did find some books there. So I came away with a couple by D.E. 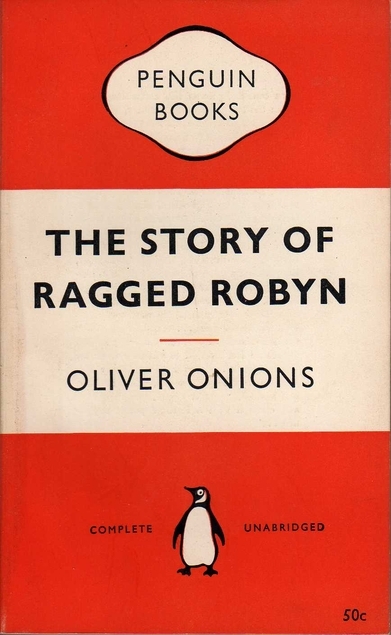 Stevensons – Five Windows and Sarah’s Cottage and also a couple of old but pristine orange Penguin books by the Bradford author Oliver Onions,Widdershins and The Story of Ragged Robin, but those ones are gifts for a friend who collects that author. We were so chuffed to find those ones. I think you’ll agree that that was quite a haul.